Water Temp has been sticking in the Mid to upper 80's. Over all it has continued to be Really good fishing. Every day has been a little different as far as depth to look for fish, but over all I'm catching most of my fish 30-40 foot down on my down rods. The thing Is that One day it will be in 45 foot of water the next it might be in 100 foot of water. There has been several locations that have been very consistent in the 45-50 foot of depth so don't be afraid to look shallower than you might think! Hope this helps you all. Plenty of fish up the rivers yet but I've seen some good numbers in the main lake and even down to the dam. A good many fish are still up lake Yet! 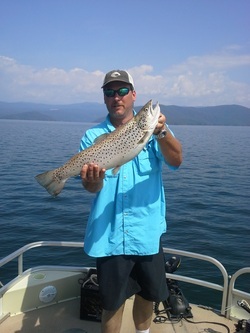 Fishing continues to be good... Water is holding around 84-85 degrees. 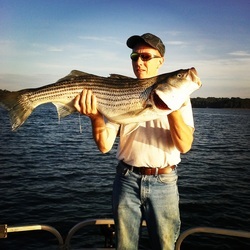 Striper are still sliding a little deeper, but I'm still able to catch fish in the mid 30's early. 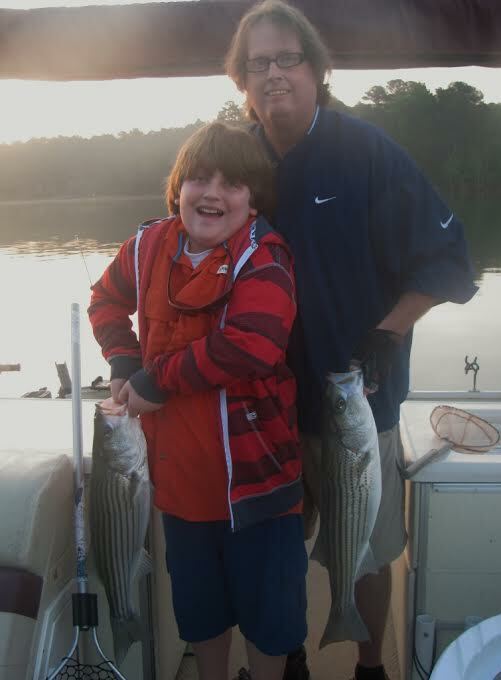 Did find some good Striper in the 50'S.... Great fishing out right now! Water temp 84..... Fishing is GOOD. I've been racking up some great fish this year. Finally today noticed that these fish are heading for deep water. I caught a good many in 45 ft of water today on downrods. Here are a few Pictures from Yesterday that were shared with me. What a Blast! Fishing is red Hot right now! Water Temp. 77-80. Fishing is Great right now. 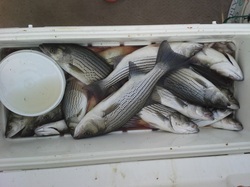 I'm am catching Stripers from 25-45 ft on Down rods Up most all the major river systems and out to the main Lake. Points, coves, main river channels... Its all good right now! 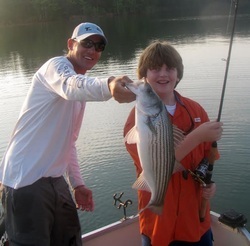 Lake Hartwell’s hybrid and striped bass have started to move up the rivers for their false spawning run and are hitting topwater lures, according to Capt. Steve Pietrykowski of Fishski Business Guide Service. Pietrykowski (864- 353-3438) keeps two, 7-foot, medium-action spinning rods ready to go at all times, one rigged with a chrome Lucky Craft Sammy and the other with a white Heddon Super Spook Jr. He customizes the Spook by painting it white with sparkles and adds extra weight so that it casts like a bullet. Pietrykowski uses 8- to 14-pound braid because it floats and gives him the extra distance he needs to reach out to these fish. He ties the lure on with a Uni knot. 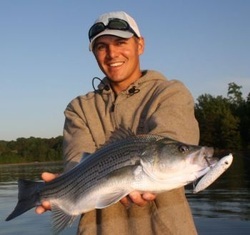 During the spring, anglers can “run and gun” to get these fish or basically wait on the fish to surface near the boat. Pietrykowski likes to get the fish coming up near the boat by throwing out live shad. It will not long be the fish start sucking down the bait. Pietrykowski makes long casts when the fish surface, and he tries to “hit ‘em in the head.” The fish will generally strike as soon as the lure hits the water and attack the lure and not blow up on it. These hybrids/stripers are schooling up and down the Seneca River and its tributary creeks: Martin, Coneross and Eighteen Mile. 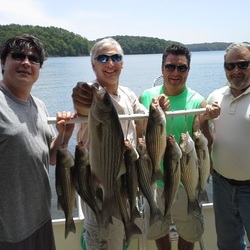 The Keowee River is also loaded with fish. 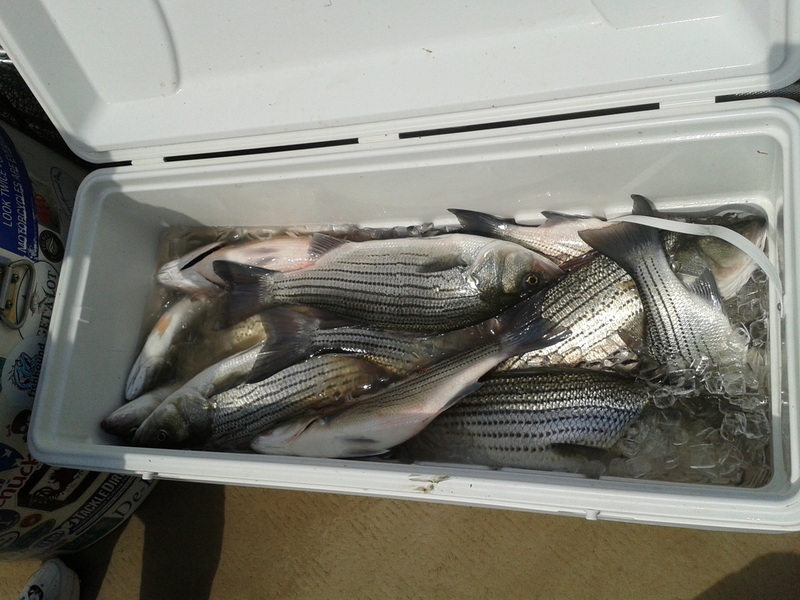 Most of these fish from are running from 1 ½ to 7 pounds, and most are hanging right off the river channel. They are holding in 20 feet of water and suspended in depths from 14 to 18 feet. In the next couple weeks as water warms, the fish will start moving back down the rivers into deeper water, and the topwater bite will leave with the fish. Capt. Steve is a Registered US Coast Guard Capt. Being 32 years old, Capt Steve has made a living fishing for over 12 years. Capt. Steve has logged many hours on the US and International waters fishing for Salmon in the rivers of Alaska down to the Florida Keys after Sailfish and over to the Bahamas Blue Marlin fishing.